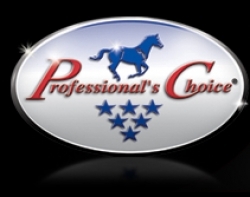 Professional’s Choice is a family run business that has specialized in equine sports medicine products for the last 25 years. Since the company’s start with the sale of the original Sports Medicine Boot for horses, Professional’s Choice has become an industry leader recognized for its dedication to the comfort of horses and a manufacturer of quality equine products. In addition to equine leg care products, Professional’s Choice offers a wide array of equine essentials including saddle pads, cinches, girths, bits and other horse accessories for both the recreational rider and the professional competitor.